El melanoma es una de las neoplasias malignas de la piel más agresivas y peligrosas. Tiene múltiples factores de riesgo, siendo uno de los más importantes la exposición crónica e intermitente al sol. Además, tiene un componente genético que se asocia a los casos familiares, debido principalmente a las mutaciones del gen CDKN2A; sin embargo, la mayoría de los melanomas son esporádicos. En su patogenia se describen mutaciones en la línea germinal y mutaciones somáticas, las cuales modifican la regulación del ciclo celular y permiten un crecimiento no regulado. El sistema inmunitario juega un papel muy importante en la patogénesis porque, a pesar de que este tumor tiene antígenos que son claramente reconocidos, permitiendo que el sistema inmunitario monte una respuesta, las células del melanoma logran evadir la inmunidad innata y la adaptativa, para así invadir y generar metástasis. 1. Balch CM, Gershenwald JE, Soong S-J, Thompson JF, Atkins MB, Byrd DR, et al. Final version of 2009 AJCC melanoma staging and classification. J. Clin. Oncol. 2009;27:6199–206. 2. Linos E, Swetter SM, Cockburn MG, Colditz GA, Clarke CA. Increasing burden of melanoma in the United States. J. Invest. Dermatol. 2009;129:1666–74. 3. Whiteman DC, Valery P, McWhirter W, Green AC. Risk factors for childhood melanoma in Queensland, Australia. Int. J. Cancer. 1997;70:26–31. 4. Jemal A, Murray T, Samuels A, Ghafoor A, Ward E, Thun MJ. Cancer statistics, 2003. CA Cancer J Clin. 2003;53:5–26. 5. Edwards BK, Brown ML, Wingo PA, Howe HL, Ward E, Ries LAG, et al. Annual report to the nation on the status of cancer, 1975- 2002, featuring population-based trends in cancer treatment. J. Natl. Cancer Inst. 2005;97:1407–27. 6. Jemal A, Siegel R, Ward E, Hao Y, Xu J, Murray T, et al. Cancer statistics, 2008. CA Cancer J Clin. 2008;58:71–96. 7. Jemal A, Siegel R, Ward E, Hao Y, Xu J, Thun MJ. Cancer statistics, 2009. CA Cancer J Clin. 2009;59:225–49. 8. Acosta ÁE, Fierro E, Velásquez VE, Rueda X. Melanoma: patogénesis, clínica e histopatología. (Spanish). Revista de la Asociación Colombiana de Dermatología y Cirugía Dermatológica. 2009;17:87–108. 9. Nova-Villanueva J, Sánchez-Vanegas G, De Quintana LP. Cáncer de Piel: Perfil Epidemiológico de un Centro de Referencia en Colombia 2003-2005. (Spanish). Revista de Salud Pública. 2007 dic;9:595–601. 13. Rhodes AR, Weinstock MA, Fitzpatrick TB, Mihm MC Jr, Sober AJ. 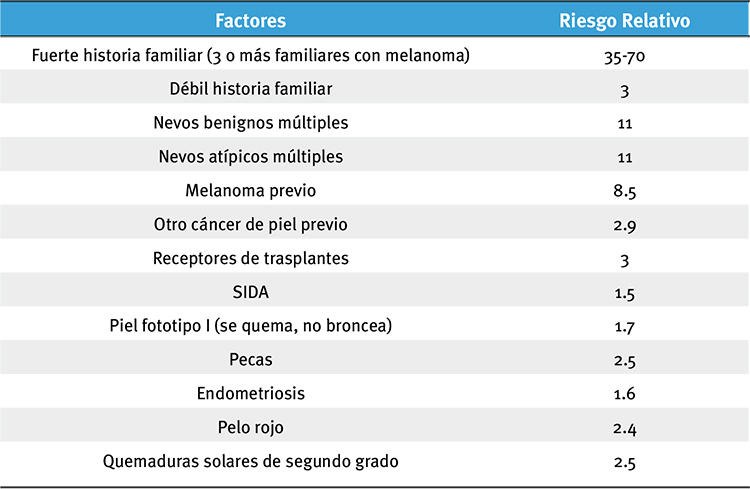 Risk factors for cutaneous melanoma. A practical method of recognizing predisposed individuals. JAMA. 1987;258:3146–54. 14. Elwood JM, Jopson J. Melanoma and sun exposure: an overview of published studies. Int. J. Cancer. 1997;73:198–203. 15. Kvaskoff M, Mesrine S, Fournier A, Boutron-Ruault M-C, ClavelChapelon F. Personal history of endometriosis and risk of cutaneous melanoma in a large prospective cohort of French women. Arch. Intern. Med. 2007;167:2061–5. 16. Olsen JH, Friis S, Frederiksen K, McLaughlin JK, Mellemkjaer L, Møller H. Atypical cancer pattern in patients with Parkinson’s disease. Br. J. Cancer. 2005;92:201–5. 17. Harrison SL, MacLennan R, Speare R, Wronski I. Sun exposure and melanocytic naevi in young Australian children. Lancet. 1994;344:1529–32. 18. Bataille V, Bishop JA, Sasieni P, Swerdlow AJ, Pinney E, Griffiths K, et al. Risk of cutaneous melanoma in relation to the numbers, types and sites of naevi: a case-control study. Br. J. Cancer. 1996;73:1605–11. 19. Olsen CM, Carroll HJ, Whiteman DC. Estimating the attributable fraction for cancer: A meta-analysis of nevi and melanoma. Cancer Prev Res (Phila). 2010;3:233–45. 20. Bradford PT, Freedman DM, Goldstein AM, Tucker MA. Increased risk of second primary cancers after a diagnosis of melanoma. Arch Dermatol. 2010;146:265–72. 21. Chaudru V, Chompret A, Bressac-de Paillerets B, Spatz A, Avril M-F, Demenais F. Influence of genes, nevi, and sun sensitivity on melanoma risk in a family sample unselected by family history and in melanoma-prone families. J. Natl. Cancer Inst. 2004;96:785–95. 23. Celebi JT, Ward KM, Wanner M, Polsky D, Kopf AW. Evaluation of germline CDKN2A, ARF, CDK4, PTEN, and BRAF alterations in atypical mole syndrome. Clin. Exp. Dermatol. 2005;30:68–70. 24. Penn I. Malignant melanoma in organ allograft recipients. Transplantation. 1996;61:274–8. 25. Kelly JW, Sagebiel RW, Blois MS. Regression in malignant melanoma. A histologic feature without independent prognostic significance. Cancer. 1985;56:2287–91. 26. Ibrahim N, Haluska FG. Molecular pathogenesis of cutaneous melanocytic neoplasms. Annu Rev Pathol. 2009;4:551–79. 27. Chudnovsky Y, Khavari PA, Adams AE. Melanoma genetics and the development of rational therapeutics. J. Clin. Invest. 2005;115:813–24. 28. Hocker TL, Singh MK, Tsao H. Melanoma genetics and therapeutic approaches in the 21st century: moving from the benchside to the bedside. J. Invest. Dermatol. 2008;128:2575–95. 29. Singh M, Lin J, Hocker TL, Tsao H. Genetics of melanoma tumorigenesis. Br. J. Dermatol. 2008;158:15–21. 30. Bauer J, Curtin JA, Pinkel D, Bastian BC. Congenital melanocytic nevi frequently harbor NRAS mutations but no BRAF mutations. J. Invest. Dermatol. 2007;127:179–82. 31. Davies H, Bignell GR, Cox C, Stephens P, Edkins S, Clegg S, et al. Mutations of the BRAF gene in human cancer. Nature. 2002;417:949–54. 32. Pollock PM, Harper UL, Hansen KS, Yudt LM, Stark M, Robbins CM, et al. High frequency of BRAF mutations in nevi. Nat. Genet. 2003;33:19–20. 33. Patton EE, Widlund HR, Kutok JL, Kopani KR, Amatruda JF, Murphey RD, et al. BRAF mutations are sufficient to promote nevi formation and cooperate with p53 in the genesis of melanoma. Curr. Biol. 2005;15:249–54. 34. Thompson JF, Scolyer RA, Kefford RF. Cutaneous melanoma in the era of molecular profiling. Lancet. 2009;374:362–5. 35. Yamada KM, Araki M. Tumor suppressor PTEN: modulator of cell signaling, growth, migration and apoptosis. J. Cell. Sci. 2001;114:2375–82. 36. Stahl JM, Sharma A, Cheung M, Zimmerman M, Cheng JQ, Bosenberg MW, et al. Deregulated Akt3 activity promotes development of malignant melanoma. Cancer Res. 2004;64:7002–10. 37. Tsao H, Goel V, Wu H, Yang G, Haluska FG. Genetic interaction between NRAS and BRAF mutations and PTEN/MMAC1 inactivation in melanoma. J. Invest. Dermatol. 2004;122:337–41. 38. Wu H, Goel V, Haluska FG. PTEN signaling pathways in melanoma. Oncogene. 2003;22:3113–22. 39. Wu M, Hemesath TJ, Takemoto CM, Horstmann MA, Wells AG, Price ER, et al. c-Kit triggers dual phosphorylations, which couple activation and degradation of the essential melanocyte factor Mi. Genes Dev. 2000;14:301–12. 40. Curtin JA, Busam K, Pinkel D, Bastian BC. Somatic activation of KIT in distinct subtypes of melanoma. J. Clin. Oncol. 2006;24:4340–6. 41. Dai DL, Wang Y, Liu M, Martinka M, Li G. Bim expression is reduced in human cutaneous melanomas. J. Invest. Dermatol. 2008;128:403–7. 42. Tang L, Tron VA, Reed JC, Mah KJ, Krajewska M, Li G, et al. Expression of apoptosis regulators in cutaneous malignant melanoma. Clin. Cancer Res. 1998;4:1865–71. 43. Dunn GP, Bruce AT, Ikeda H, Old LJ, Schreiber RD. Cancer immunoediting: from immunosurveillance to tumor escape. Nat. Immunol. 2002;3:991–8. 44. Castelli C, Rivoltini L, Andreola G, Carrabba M, Renkvist N, Parmiani G. T-cell recognition of melanoma-associated antigens. J. Cell. Physiol. 2000;182:323–31. 45. Griffioen M, Kessler JH, Borghi M, van Soest RA, van der Minne CE, Nouta J, et al. Detection and functional analysis of CD8+ T cells specific for PRAME: a target for T-cell therapy. Clin. Cancer Res. 2006;12:3130–6. 46. Bennett DC. Human melanocyte senescence and melanoma susceptibility genes. Oncogene. 2003;22:3063–9. 47. Kawakami Y, Eliyahu S, Delgado CH, Robbins PF, Rivoltini L, Topalian SL, et al. Cloning of the gene coding for a shared human melanoma antigen recognized by autologous T cells infiltratinginto tumor. Proc. Natl. Acad. Sci. U.S.A. 1994;91:3515–9. 48. Coulie PG, Brichard V, Van Pel A, Wölfel T, Schneider J, Traversari C, et al. A new gene coding for a differentiation antigen recognized by autologous cytolytic T lymphocytes on HLA-A2 melanomas. J. Exp. Med. 1994;180:35–42. 49. Boon T, Coulie PG, Van den Eynde BJ, van der Bruggen P. Human T cell responses against melanoma. Annu. Rev. Immunol. 2006;24:175–208. 50. Xiao J, Chen H-S. [Biological functions of melanoma-associated antigens (MAGEs) in cell activities]. Ai Zheng. 2005;24:124–8. 51. Stockert E, Jäger E, Chen YT, Scanlan MJ, Gout I, Karbach J, et al. A survey of the humoral immune response of cancer patients to a panel of human tumor antigens. J. Exp. Med. 1998;187:1349–54. 52. Eggermont AMM, Schadendorf D. Melanoma and immunotherapy. Hematol. Oncol. Clin. North Am. 2009;23:547–64. 53. Krönig H, Hofer K, Conrad H, Guilaume P, Müller J, Schiemann M, et al. Allorestricted T lymphocytes with a high avidity T-cell receptor towards NY-ESO-1 have potent anti-tumor activity. Int. J. Cancer. 2009;125:649–55. 54. Carretero R, Romero JM, Ruiz-Cabello F, Maleno I, Rodriguez F, Camacho FM, et al. Analysis of HLA class I expression in progressing and regressing metastatic melanoma lesions after immunotherapy. Immunogenetics. 2008;60:439–47. 55. Hersey P, Si Z, Smith MJ, Thomas WD. Expression of the costimulatory molecule B7 on melanoma cells. Int. J. Cancer. 1994;58:527–32. 56. Dong H, Strome SE, Salomao DR, Tamura H, Hirano F, Flies DB, et al. Tumor-associated B7-H1 promotes T-cell apoptosis: a potential mechanism of immune evasion. Nat. Med. 2002;8:793–800. 57. Natali PG, Hamby CV, Felding-Habermann B, Liang B, Nicotra MR, Di Filippo F, et al. Clinical significance of alpha(v)beta3 integrin and intercellular adhesion molecule-1 expression in cutaneous malignant melanoma lesions. Cancer Res. 1997;57:1554–60. 58. Mortarini R, Piris A, Maurichi A, Molla A, Bersani I, Bono A, et al. Lack of terminally differentiated tumor-specific CD8+ T cells at tumor site in spite of antitumor immunity to self-antigens in human metastatic melanoma. Cancer Res. 2003;63:2535–45. 59. Harrell MI, Iritani BM, Ruddell A. Tumor-induced sentinel lymphnode lymphangiogenesis and increased lymph flow precede melanoma metastasis. Am. J. Pathol. 2007;170:774–86. 60. Hussein MR. Tumour-associated macrophages and melanoma tumourigenesis: integrating the complexity. Int J Exp Pathol.2006;87:163–76. 61. Moore KW, de Waal Malefyt R, Coffman RL, O’Garra A. Interleukin-10 and the interleukin-10 receptor. Annu. Rev. Immunol. 2001;19:683–765. 62. Repp AC, Mayhew ES, Apte S, Niederkorn JY. Human uveal melanoma cells produce macrophage migration-inhibitory factor to prevent lysis by NK cells. J. Immunol. 2000;165:710–5. 63. Petrenko O, Moll UM. Macrophage migration inhibitory factor MIF interferes with the Rb-E2F pathway. Mol. Cell. 2005;17:225–36. 64. Bosserhoff AK, Buettner R. Expression, function and clinical relevance of MIA (melanoma inhibitory activity). Histol. Histopathol. 2002;17:289–300. 65. Callejo SA, Marshall J-C, Cools-Lartigue J, Saraiva VS, Burnier MN Jr. Macrophage-derived soluble factor enhances melanoma inhibitory activity expression by uveal melanoma cells in vitro. Melanoma Res. 2004;14:91–5. 66. Stene MA, Babajanians M, Bhuta S, Cochran AJ. Quantitative alterations in cutaneous Langerhans cells during the evolution of malignant melanoma of the skin. J. Invest. Dermatol. 1988;91:125–8. 67. Ladányi A, Kiss J, Somlai B, Gilde K, Fejos Z, Mohos A, et al. Density of DC-LAMP(+) mature dendritic cells in combination with activated T lymphocytes infiltrating primary cutaneous melanoma is a strong independent prognostic factor. Cancer Immunol. Immunother. 2007;56:1459–69. 68. Chen PW, Mellon JK, Mayhew E, Wang S, He YG, Hogan N, et al. Uveal melanoma expression of indoleamine 2,3-deoxygenase: establishment of an immune privileged environment by tryptophan depletion. Exp. Eye Res. 2007;85:617–25. 69. Derynck R, Akhurst RJ, Balmain A. TGF-beta signaling in tumor suppression and cancer progression. Nat. Genet. 2001;29:117–29. 70. Jandus C, Bioley G, Speiser DE, Romero P. Selective accumulation of differentiated FOXP3(+) CD4 (+) T cells in metastatic tumor lesions from melanoma patients compared to peripheral blood. Cancer Immunol. Immunother. 2008;57:1795–805. 71. Polak ME, Borthwick NJ, Gabriel FG, Johnson P, Higgins B, Hurren J, et al. Mechanisms of local immunosuppression in cutaneous melanoma. Br. J. Cancer. 2007;96:1879–87. 72. Zamai L, Ponti C, Mirandola P, Gobbi G, Papa S, Galeotti L, et al. NK cells and cancer. J. Immunol. 2007;178:4011–6. 73. Pardoll DM. Immunology. Stress, NK receptors, and immune surveillance. Science. 2001;294:534–6. 74. Hayakawa Y, Kelly JM, Westwood JA, Darcy PK, Diefenbach A, Raulet D, et al. Cutting edge: tumor rejection mediated by NKG2D receptor-ligand interaction is dependent upon perforin. J. Immunol. 2002;169:5377–81. 75. Paul P, Rouas-Freiss N, Khalil-Daher I, Moreau P, Riteau B, Le Gal FA, et al. HLA-G expression in melanoma: a way for tumor cells to escape from immunosurveillance. Proc. Natl. Acad. Sci. U.S.A. 1998;95:4510–5. 76. Hahne M, Rimoldi D, Schröter M, Romero P, Schreier M, French LE, et al. Melanoma cell expression of Fas(Apo-1/CD95) ligand: implications for tumor immune escape. Science. 1996;274:1363–6.